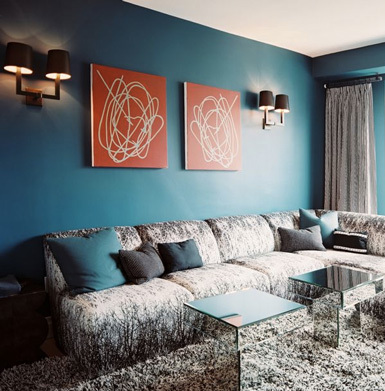 belle maison: Design Dilemma: What to do Above the Sofa? Design Dilemma: What to do Above the Sofa? Since having my son 2 months ago, I've done a lot of sitting on the sofa...recovering from a C-section, nursing, sleeping, catching up on my DVR, folding laundry, etc. 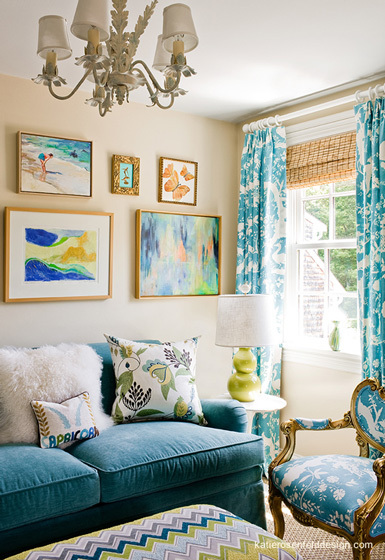 Spending so much time in our living room has sparked a desire in me to redo everything! I've stared at the room hours on end and have re-designed it about 100 times. I wish I had the money to do a complete overhaul, but that's not an option right now, so I need to get creative on how to change things up without breaking the bank. First item on the list: replace the giant piece of art on the wall above my sofa. This painting has been hanging on our wall for 5 years and I'm SO over it! The dilemma: there's quite a bit of wall space to fill so a small mirror medium size piece of art won't cut it. I know I'm not the only one with this same challenge - I'm sure many of you have wondered what to do above your own sofa, right? So, I went searching online to find some great ideas to spark some inspiration and here's what I found. If you have any other great ideas, please share them :) I'll keep you posted on the progress of my mini-living room makeover as I slowly make changes! The first thing that came to my mind was to hang a large (long) piece of fabric behind the sofa, from the roof down to the floor. Either flat against the wall, or (and here, my limited vocabulary in English becomes a problem...) sort of 'wavy', almost like a curtain. The wavy one would look good in a sheer, almost see-through fabric I think. Good luck with your new living room! What a unique and fantastic idea! Thanks for sharing! Loving these ideas! I think a large canvas that makes a statement would be so fun. 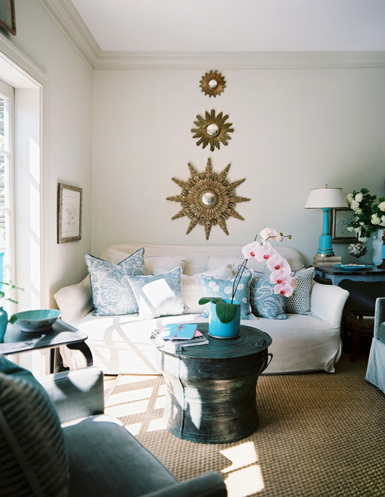 I also love the sunburst mirror idea! I hope you will share with us what you decide to do. I think the large unframed canvas is my favourite. I should really get back into art and create some things for my walls. I love sunburst mirrors...I may be leaning toward that idea! I'll definitely share the "before & afters" with you all. So many great options to choose from! However, I think I'll go for the large painting painting flanked with smaller ones on both sides! I bought a bunch of vintage film reels in multiple colors/sizes and used them on a wall...it was so different and fun! Can't wait to hear what you end up doing! So much eye candy! I like the Large piece of art with smaller ones on either side. Another idea, instead of a piece of art is to enlarge a photograph to an extra large size. 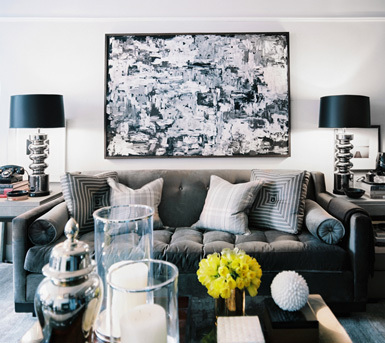 I've seen so many statement enlargements that I have loved if you choose the right photo and styled correctly. For a bit of the natural element I've seen large weathered branches (bark removed) being hung over coaches. 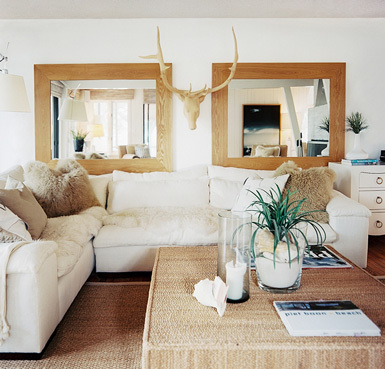 I love the texture it adds to a room. I love either a large piece of art with a cool picture lights like t2 or 3 annette library sconces above painting,or a 30 inch Dorchester at Circa. 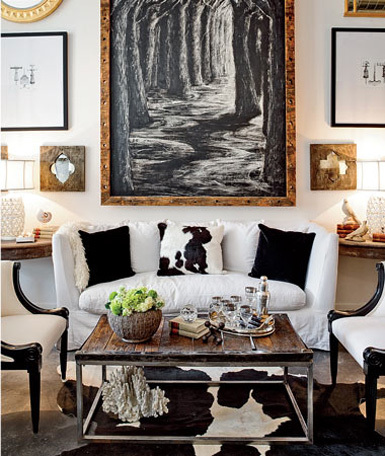 Or a gallery setting like Kristin Buckingham does, anything you do I am sure will be great! My mum in law hung a large floral print in a big gilt frame then bracketed it with a pair of mirrors that were rectangular but curved at the top, in similar gilt frames. Looked like a window with shutters and certainly widened the art. 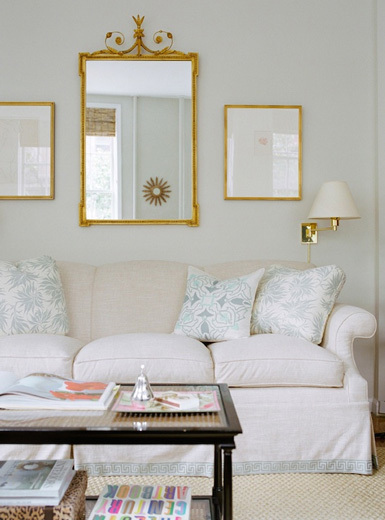 I'm looking for a coffee table like the one in the last picture with the botanicals above the couch...any idea where they got it?